Salmon is one of my favorite fish to eat because it usually cooks fairly quick and it’s usually pretty satisfying without feeling too heavy. 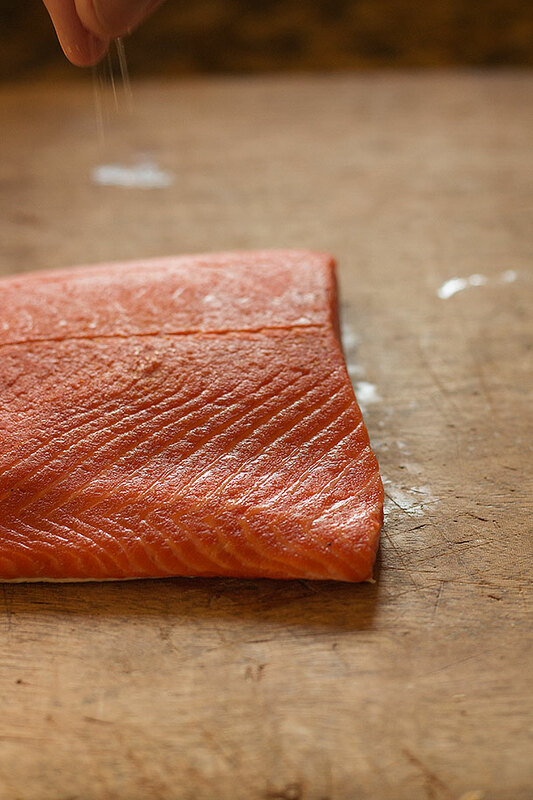 I usually make my Crispy Skin Salmon whenever I have salmon because it’s super quick and I almost never get bored of it. Something about the alluring crispy skin get’s me every time. Well, I say every time, but that is obviously not the case because I am posting this recipe. On top of loving salmon I also really like a good curry. I make a lot of curries whenever I get the chance, even with the knowledge that the house will smell of garlic and ginger hours afterwards. It can’t just be me that likes the lingering scent of garlic and ginger , that sweet and musty smell that gets your gut rumbling. Maybe it is just me. When ever I make a curry I usually brown my meat first. For two reasons, color and flavor. Which are actually completely related when it comes to cooking. Most of the time color means flavor, if it has no color it probably wont have much taste either. Which is what is interesting about this dish. I don’t brown the fish at all, rather I just let it simmer in the curry base immediately. Not only does this save time, but it actually enhances the flavor of the entire dish quite a lot by letting all of those beautiful salmon flavors leech into the curry sauce. I would absolutely consider this an instant gratification meal because it’s so fast but it tastes like it was a long braise. Most of the time if you want a braise you have to take some time to get it done. Last minute cravings for braises are usually not good for your stress levels, well they aren’t for mine at least. This doesn’t give that feeling of accomplishment of a long braise until you taste it. The flavors have a surprising depth even after such a quick cooking period. I am probably sounding like a broken record explaining over and over how much depth the flavor has with a quick cooking time but you should have seen the look on my parents face when they tasted it. Cut onion into fourths and place in a food processor with garlic and ginger and pulse until you get a paste. Heat coconut oil or ghee in a medium sized pan over medium heat and add onion, garlic and ginger paste and saute until slightly transluscent. Add spice mixture to the paste and mix to prevent burning. Saute for 2 minutes or until mixture begins to become very fragrant. Deglaze the pan with chicken stock scraping the bottom of the pan to release any stuck bits then add fish sauce, lime juice from 1 lime, almond butter and tomatoes and bring to a simmer. Once simmering add cubed salmon and lower heat to low heat, cover and cook for 10-15 minutes or until salmon flakes with a fork. Serve with sauce and chopped fresh cilantro on top. This looks so delicious! Do you have a recommendation for a premade curry spice blend rather than making my own? Well every curry powder varies greatly in flavor. It won’t necessarily taste the same but I do like Morton and Bassets organic curry powder. 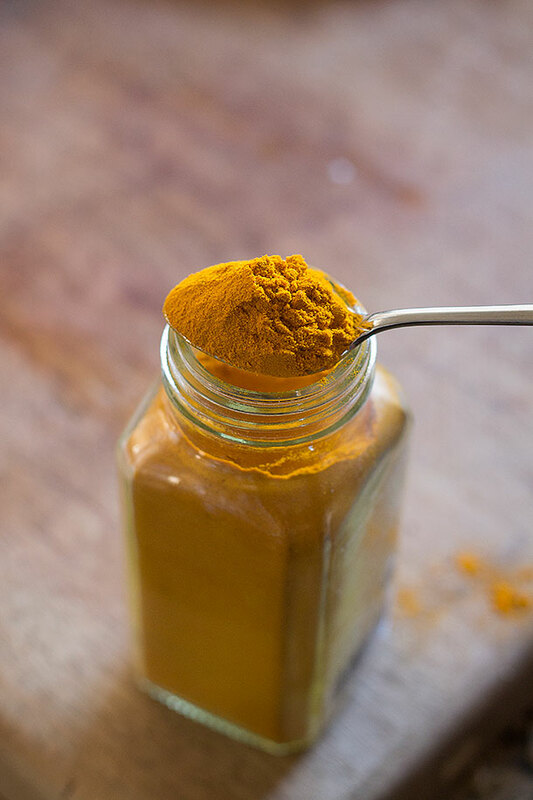 Whatever curry powder you use just use 2 tablespoons in substitution. As I said though, it will taste very different to that of mine, but will still have that “curry” essence. Question on the recipe: When deglazing in step 5, do you reintroduce the spicy paste into the pan/sauce when you add the fish sauce, almond butter, and tomatoes ? Deglazing requires pouring most of it off before adding the broth to deglaze, not clear whether you added it back in to thicken and make the sauce. Woops! Just fixed the recipe. Add it in when you add in the almond butter and what not. I will definitely be trying it out soon! This is a really great idea to put fish in a curry… I don’t know why that did not cross my mind before! Can this be made without the almond butter? HOT DANG!I don’t usually eat much fish so I was scouring the interwebs for a recipe to gently introduce me to fish and I went with this one. I’m here, ladies, gentlemen and those in between, that I made the right desicion. Cheers buddy! Your contribution to the culinary arts will not go unapplauded. Thank you so much Pablo, that truly means a lot to me. I’m glad that this worked out as a nice introduction fish for you, a lot of people find salmon difficult to adjust to as their first fish. P.s. goes well with red wine. Thank you. A fantastic recipe. We all loved it. Wow! A wonderfully fragrant curry. I have just cooked this for my partner and I and our plates were empty in no time. I’ll certainly be cooking it again. Thank you for publishing it. 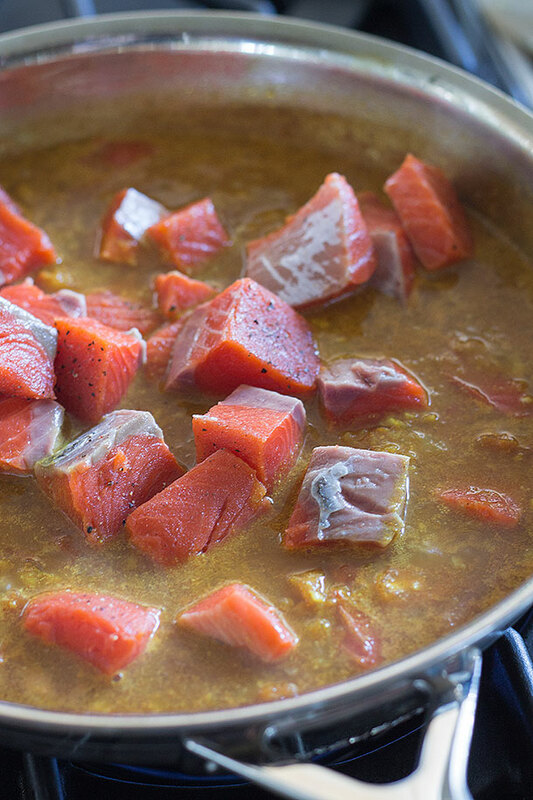 Before I found this recipe I already had a salmon curry dish in mind that I wanted to cook. Thank you for this recipe. Yum!!! The almond paste is a great idea for thickening not to mention the flavour. Another non-grain thickener that goes well with salmon is grated zucchini. Dust it first with the curry and a bit of salt, toss with oil and heat in the microwave. It cooks down fast, then add salmon. Great recipe! I used to eat this all the time from an indian restaurant in Berkeley, but I moved and nowhere nearby makes it the same. This fits the bill perfectly! I admit I made a lot of adjustments just because I didn’t have the ingredients, like using garam masala instead of the curry spice mix (I still added the paprika and a 1/3 cumin called for). I added a little sugar and worchestshire sauce at the end to top it off, since it was missing a little something. The tomatoes are a must! Without them the dish will taste off, the tomatoes really round it out. I made this fish curry dish tonight. It was fantastic! Served it over organic veggies. 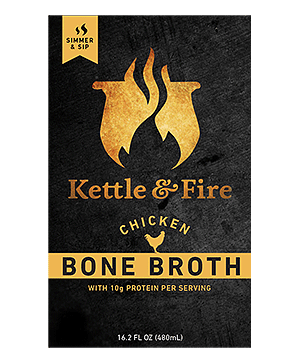 Made this with chicken and it was amazing served over cauli-rice. Thanks for the great recipe! I made this last night for myself and some friends and EVERYONE loved it. It was amazing!! 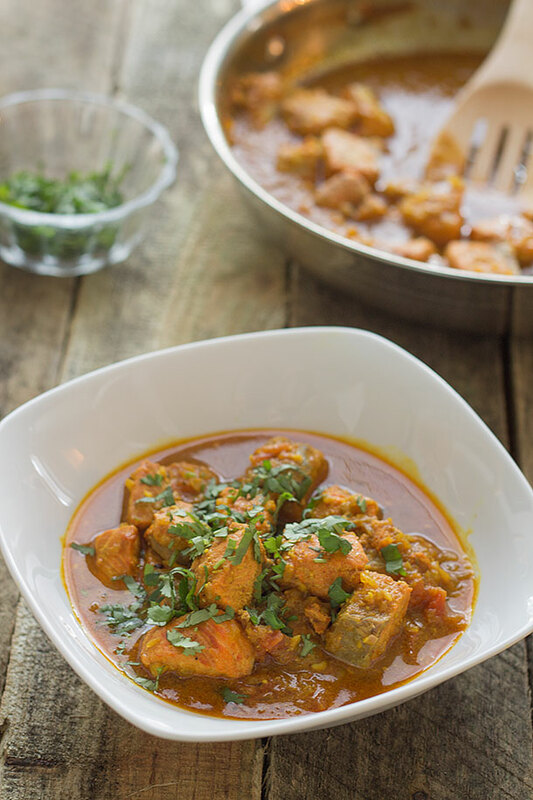 All the flavours meshed so well and it was one of the best curries I’ve ever made. Will be making time and time again. Very good. A lot of dirty small dishes, but well worth it. My spouse and I love this dish. 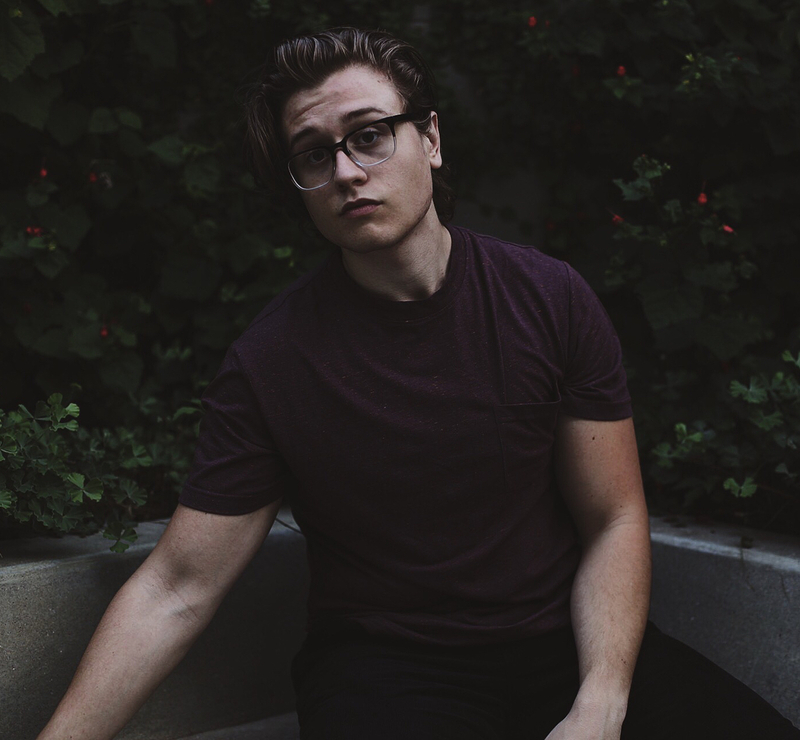 I was diagnosed with an autoimmune disorder which is triggered by eating gluten. I also had to go on a 6-Food Elimination Diet (no gluten, no soy, no eggs, no dairy, no fish or seafood, no peanuts or tree nuts). Am in the process of reintroducing those foods one at a time to see if they are safe or whether they are (their proteins, specifically) triggers for the Eosiniphilic Esophagitis. So far, soy and fish are ok. Tahini works as a substitute for the almond paste for those with nut allergies. This has been a great dish for me to get some tasty proteins…and it doesn’t get old! Thanks so much for your recipe. Made this dish tonight and it was incredible! We added spinach at the very end for some color and it was awesome. Can’t wait to make it again. Found this recipe list night and cooked it – couldn’t believe the flavours. Changed it up a little based on some recent Indian cooking classes. In fact I doubled the sauce and added a tin of chickpeas and some baby spinach too :-). I used white pepper instead of black and increased a bit, a little less cinnamon and added a teaspoon of chilli powder and one of garam masala. And I didn’t have mustard powder. For the tomatoes … I blended them so my sauce was a bit thicker and so delicious. Nothing left for lunch today! Husband allergic to almonds so organic (no sugar no salt) peanut butter. I should add I don’t follow any of the diets/regimes mentioned but this recipe is brilliant for anyone. 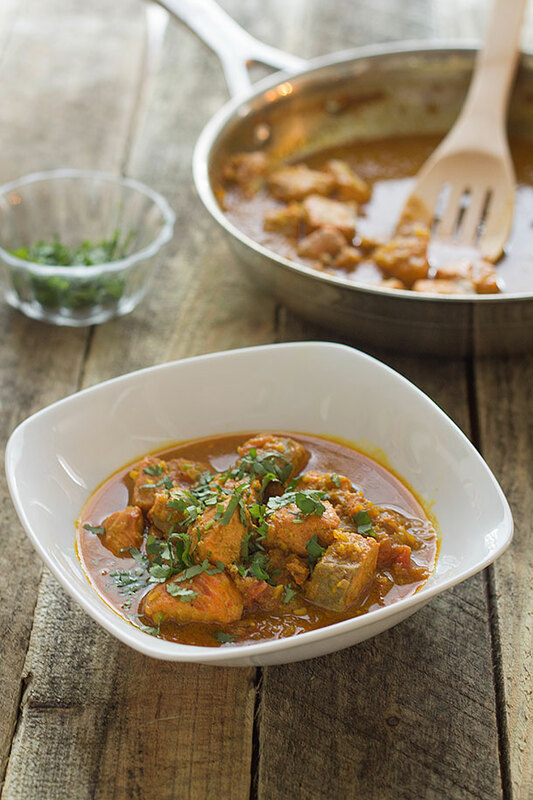 This salmon curry is beyond awesome- light, fragrant, fulfilling and delicious! 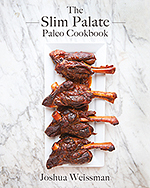 Can’t wait to try other recipes from Slim Palate. Thank you!